Tomasz Drewicz | "Be the Change You want to see in a world"
As the Pole born in the era of baby boomers from the beginning of the eighties, already at the very start of my conscious life, did I feel placed BETWEEN broader tradition and the „new”. I have never got rid of this feeling, and probably like most people of my generation, it brought about a huge difficulty in reaching the self-awareness. Although I would not like to emphasize this too much, I do believe that the fact of growing in Poland, in the post-communist reality, is quite important, especially as far as my approach to art is concerned. Political changes, a free capital market, computerization, telecommunications revolution along with the globalization and gender studies, surrounded me with unstable ground; fluid mass, difficult to move around, not to mention building something on. My preference for exact science, with simultaneous attraction to humanities added further complexity to the issue. In short, I have always been put in the position BETWEEN — as if first days of my existence marked the beginning of permanent blurring of boundaries in all of the emerging aspects. Until recently, this state of affairs made me very tired. I was internally exhausted, both in terms of my work and normal daily functioning. END is another term, which I often encountered on my path. Although I did not experience the „end of communism”, I definitely was a child of its fall. I experienced the end of the millennium, the end of the Third Republic, and thanks to Francis Fukuyama also the The end of History and the The end of man. I was born just two years before the declaration of The End (Death) of art, prophesied already in 1984 both by Arthur C. Danto and Hans Belting. Obviously, at that time I did not know about it. Perhaps, these are the reasons why my artistic productions are often based on the principle of reflection. As early as during my studies at the Poznan Academy, my works operated on that particular approach, although at that time it was probably the result rather of intuition than a conscious decision. I was extremely fascinated by the theories of interactivity. I repeatedly invited people to co-create my work, both during the process of creation and reception. I was looking for answers to questions about the individual’s identity, communication, distance in relationships, the extent and sustainability of the various strategies — contacts with THE OTHER ONE. This was indirectly manifested by my interest in performance. Today, when I look at this important period of my work, I perceive it as extremely chaotic. Though not without meaning and relevant content, that time was difficult for me to assimilate, because, while attempting to overcome my own shyness, I could not find further creative motivation there, feeling it more as a form of therapy. However, the collected experience was priceless for my current interests. I think that it gave me the opportunity to finally understand the mechanism of how everything that surrounds us PERFORMS. Therefore, my works pay attention to the process — pointing out areas in which broad BEHAVIOUR has the chance to highlight its individual meaning, thus at the same time becoming very specific and universal. As a rule, I make use of quite simple means. Collected and organized against the specific context, they can operate on many levels. E.g., my intervention in the space of Poznan Palm House, entitled Memorandum. 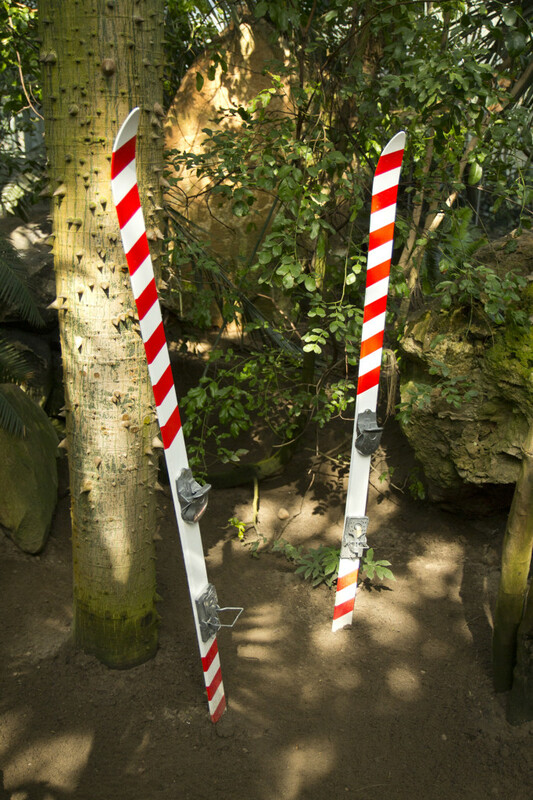 A pair of skis, painted in white and red stripes, referring to the pillars (obelisks) delimiting the country border, was thrust into the ground in one of the pavilions tightly filled with lush, tropical vegetation. Bindings for ski boots have been replaced by imitating them rat traps. The direct inspiration for the creation of this work came from an agreement signed at the beginning of April 2013 between Gazprom and Polish EuRoPol Gas. The title memorandum, i.e. diplomatic letter having no legal effect, at that time served on the Polish scene as a tool for internal political games. This content, however, is just indicated, though, of course, remaining important for the whole, it does not exclude the possibility of a deep interpretation in other contexts, even in the area of current migration crisis. A similar principle is characteristic for most of my works, and these most important ones, in my opinion, are described in this publication. Therefore, I invite you to get acquainted with this material and search for other meanings — those most important to you, both in my and other artistic endeavors.